1. Omega-3 fatty acids are important for a healthy scalp. Salmon is an excellent source of omega-3 fatty acids. If you are vegetarian, you can get omega-3 fatty acids by adding a tablespoon or two of flax seeds to your diet each day. 2. Vitamins A and C are used by the body to make sebum. Sebum is an oily secretion of the hair follicles, something like the body’s own conditioner. Vitamins A and C are found in dark green vegetables. 3. Protein, zinc, iron and biotin are all essential for strong, healthy hair growth. Eating three plus cups of beans or lentils every week will supply these essential hair nutrients. It should be noted that iron deficiency and hair loss go hand in hand. 4. Selenium, alpha-linolenic acid and zinc are found in nuts. They help you have a healthy scalp. If you are deficient in zinc, your hair will shed. 5. Vitamin B-12 and biotin are essential for hair growth. Biotin hair growth is stronger and healthier. Both of these nutrients are found in eggs. Eggs are also a good source of protein which contributes to faster hair growth. 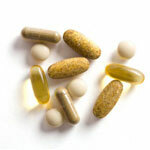 If you are not getting enough vitamins for hair growth in your diet, you may want to take supplements. You can ask your doctor to perform blood tests to check to see if you are deficient in vitamins for hair growth. Not all hair loss can be attributed to vitamins. Hormonal imbalances, heredity, and autoimmune conditions like alopecia areata and lupus can also be responsible for hair loss. Ask your doctor to consider possible underlying conditions.